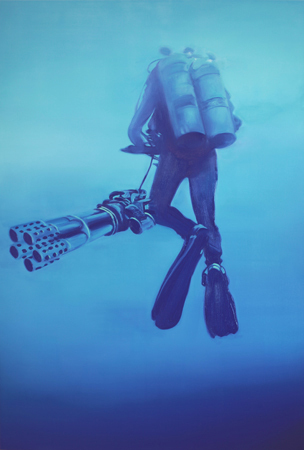 Dirk Skreber, diver (with anti-matter gatling gun), 2012. In his paintings, Skreber makes allusions to the scenery of his hometown in northern Germany. Influenced by the brimming energy of iron and steel industrial complexes, Skreber’s work reflects a scientific approach, sometimes through trial and error, to the way he invents imagery. One technique showcases illuminated forms through an optical gradation created by plucking away at foam tape–an example of the artist’s inventive practice. Skreber has also developed a painting method by which he creates forms through thickly layered paint in broken concentric rings. The exhibition includes the artist’s 2012 film work, Turgidity, which documents an orchestrated car crash in slow motion. Other works include model cars crashed around steel poles and new works on canvas. Dirk Skreber was born in Lübeck, Germany and studied at the Kunstakademie Düsseldorf. His works are included in The Saatchi Collection, the Museum für Moderne Kunst (MMK) in Frankfurt, and Skulpturenpark Köln, among others. Skreber received the National Gallery Prize for Young Artists (Hamburger Bahnhof, Berlin) in 2000, and is one of Germany’s leading contemporary artists. The artist will be visiting Japan for the first time on the occasion of this exhibition. There will be an opening reception with the artist present on October 13th starting at 18h.